Photo Credits: Tom Carter on all except as noted. Trekking in Nepal is an unforgettable experience. 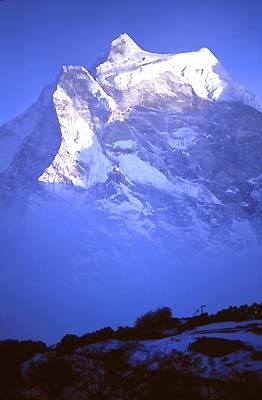 To set out hiking into the Himalayas, the highest mountains in the world, is the epitome of adventure travel. Kathmandu is still, like all of Nepal, deeply connected to its medieval past. The crowded alleyways, markets, and bazaars throng with vendors and shoppers. Throughout Kathmandu countless Hindu and Buddhist temples, shrines and statues are cloaked in incense, vermillion paste and flower petals. Acts of devotion are part of life. Much of Nepali life remains little changed in centuries. Every trek in Nepal begins in Kathmandu. It is here that a Sherpa guide is hired and the necessary permits and passes are acquired. Most trekking in Nepal involves a plane flight or bus journey to reach the roadhead where the innumerable trails of Nepal begin. Once walking, the pace of life changes. Motors are left behind. The trails are the roads of the country and are busy with load bearing porters and villagers. If you are on a walking tour in the Annapurna, Langtang or Mount Everest trekking areas you will access high mountain valleys by hiking through the "middle hills" of Nepal. Half of Nepal's twenty million people live on these intensely farmed terraced hillsides. The daily life of an active thriving culture goes on all around you as you walk. Teahouse trekking and group camp trekking are the normal modes of trekking in Nepal. Villagers have built lodges to accommodate trekkers. Camping groups normally set up in the yards of these lodges. These are great opportunities for inter-cultural exchange. You can meet local people and learn more about their way of life. If your walking tour's itinerary is flexible, you can explore off-route villages, temples, and religious festivals. The scale of the land is enormous. The villages and terraces spread endlessly far above and often just as far below you. Impossibly high above this vista the Nepal Himalayas soar into the sky. Inevitably, the trail climbs and your hiking takes you up into the Himalayan snow peaks and the thin air of high altitude. Your Sherpa guide and western leader will insure your rate of trekking allows for safe acclimatization to high altitudes. If you acclimatize well, you could be hiking as high as Everest base camp at the foot of Mt. Everest in the Khumbu area, the homeland of the Sherpa people. Or you could take on a walking tour of the Annapurna Sanctuary or the Annapurna Circuit, or trek high into the Langtang valley. These are all amazing places, impossible to visit without properly adapting to the high altitude. Once there, you are surrounded by icy giants. Clouds stream off the summit of Mt. Everest while you sit enjoying Sherpa hospitality and listen to yak bells and the chanting of monks in the temples. You feel the great satisfaction of having walked all this way through days full of new faces and new vistas. 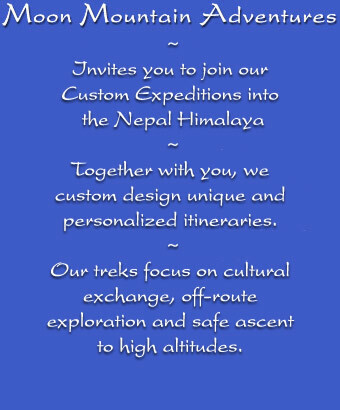 Knowing you will come trekking in Nepal again, you begin to plan your next journey. Since the Maoist Party (the insurgents) came above ground and then won the election (with a lavish dose of intimidation), the always fascinating political climate of Nepal has stabilized. Road blocks are gone and buses (even the night buses) run on schedule (as much one could hope for in the Himalaya). Tourism has rebounded. Countries around the world have dropped their Nepal travel advisories. We no longer need to factor "donations" to the "People's Party" into our trekking budget! The greatest safety hazards are the good old ones: the ankle breaking potholes of Kathmandu, all Himalayan road travel and stepping outside to relieve yourself at night without a headlamp!! Moon Mountain Adventures : Trekking in Nepal : Budget trekking expeditions into the Nepal Himalaya, off-route exploration Everest, Annapurna, Langtang. high, altitude, travel, journey, trekking, Nepal, Himalaya, tour, guide, Sherpa, mountain, culture, adventure, Kathmandu, Annapurna, Everest, Khumbu, Langtang, personal, package, Canadian, experience, hiking, highest, mountains, world, epitome, adventure, travel, Kathmandu, medieval, past,temples, shrines, Sherpa guide, Annapurna, Langtang, Mount Everest, high mountain valleys, thriving culture, group camp trekking, lodges, trekkers, camping groups, explore off-route villages, religious festivals, thin air, high altitude, Clouds, stream, Everest, yak bells, chanting of monks, Parksville, Nanaimo, Qualicum, Arrowsmith, British Columbia, B.C.